this is sharmila i installed SDx tools i am new to this. ->first time creating the project application project we need to add platform zybo is not there in platform list. ->I am tried so many methods to add custom platform for sdx 2017.4 and petalinux also 2017.4. ->and also any one share how to generate platform and creation of project in SDx guidelines in step by step. any answer will help to me. this is sharmila am adding custom platform zybo_z7_20 successfully. ->and tried to run the opencv face detection project but it showing the below error i changed the libraries also can anyone helpme. I do not have much experience with SDSoC. I have reached out to more experience SDSoC engineers to see if they have any input for you. Please also attach the log file to better help us see what is going on. sds++ -L/usr/lib --remote_ip_cache /home/roash-sw-linux/Desktop/projects/ip_cache -o "face_web.elf" ./src/main.o -lopencv_videoio -lopencv_flann -lopencv_highgui -lopencv_core -lopencv_imgcodecs -dmclkid 0 -sds-sys-config linux -sds-proc linux -sds-pf "/home/roash-sw-linux/Desktop/SdSoC-Zybo-z7-20/SDSoC-Zybo-Z7-20-master/sdsoc/zybo_z7_20/export/zybo_z7_20"
From the logs that you provided I observed that you have some errors in the linking stage, some libraries cannot be found (opencv_videoio, opencv_flann, opencv_highgui, opencv_core, opencv_imgcodecs) and a warning generated by the fact that you compare a signed integer variable with an unsigned integer variable. To solve the linking stage errors, use a xfopencv sample project as start point. Find more details in SDSoC platform readme. thanks for your quick reply can you please tell me how to run that project what you have attatched in sdsoc there is no cpp files . 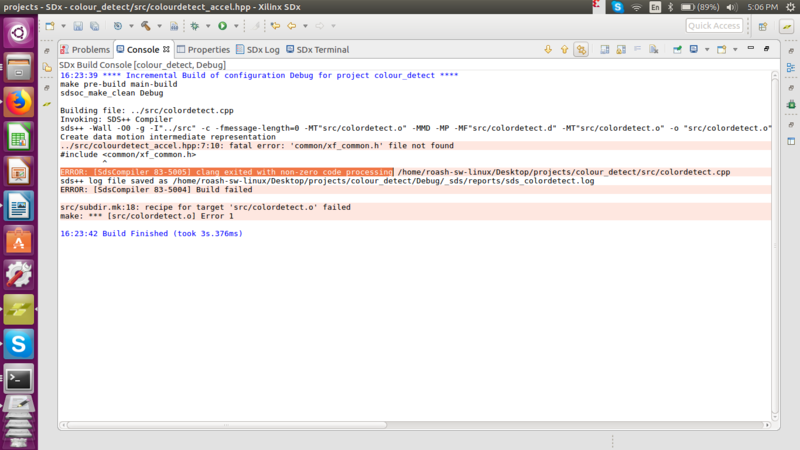 i got again error with libraries only for xfopencv project am attatching my error below ca n you please help me out. I didn't attached any project. Do you mean the sample project that I mentioned? No,I was asking about the errors above i got some clang specific error can you please help me how to clear that one. 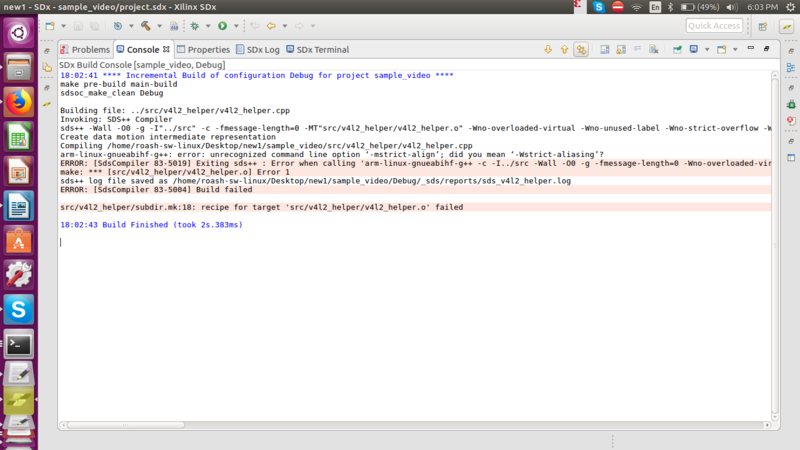 -- i got that error for all projects like opencv ,xfopencv like that. Then launch SDx 2017.4 as normal. 2. Point to an empty directory to use as a workspace. empty workspace, not the workspace with the platform generator project. 3. In the top menu bar, click "Xilinx->Add Custom Platform..."
the extracted platform (the folder this document is found in). 6. Now, in the top menu bar, click "File->New->SDx Project...". 7. Select Application Project and then press Next. 8. Name the project and press Next. 9. Select zybo_z7_20 and click Next. 10. Select Linux from the System Configuration drop-down. 11. Click Next, no other options should need to be changed on this page. required for the libraries to build. If the build process is successful, using a sample project, your system is set correctly. Let me know if you encounter any issues using the above mentioned steps. 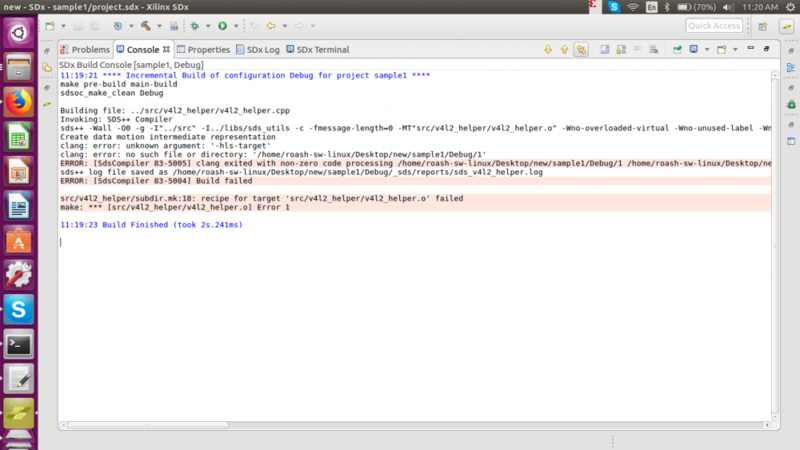 From this point you can try to replace the sources from the sample project with your code and try to build again. am following the above steps and created the sample project with default SDx example vector add its worked properly and created binaries , elf and all. but am going for next step copy the src files from that revision pcam5 project sources and runned it showing the same error. Start from a xfopencv-oriented sample like Simple Filter2d Live I/O demo. Can you provide the source files of your project? 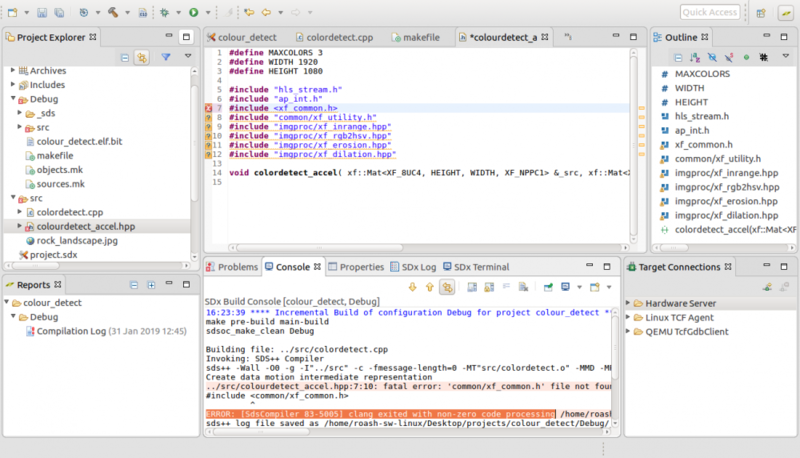 in the same terminal window and try to build the project again. i tried what you said the above but i got again same error(first screenshot). and when i remove target_hls 1 its going to another error(second screenshot). am encouter with new error previous errors was gone like i changed to test platform for same project there only like zc702,701,zed,701 again i came to zybo . ->previous errors was gone but these errors related to program ?? 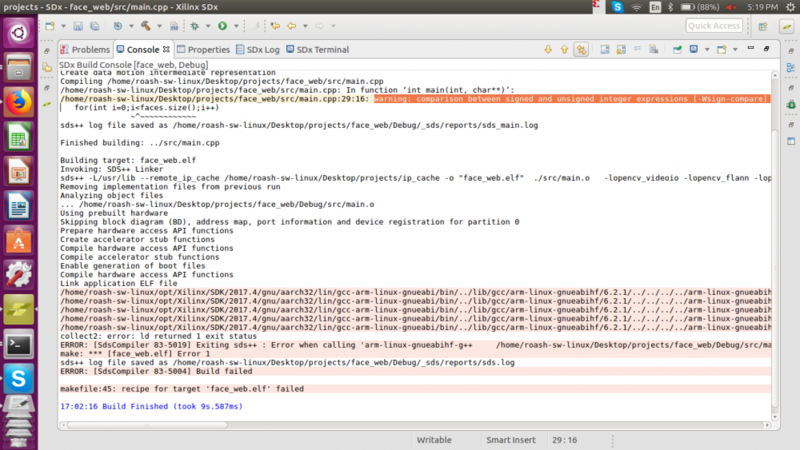 Did you get these errors using a sample project or using your own source code? I am confused. In this post you mentioned you were able to successfully build the default SDx example vector add project. Can you provide the link to the github project you are referring to? 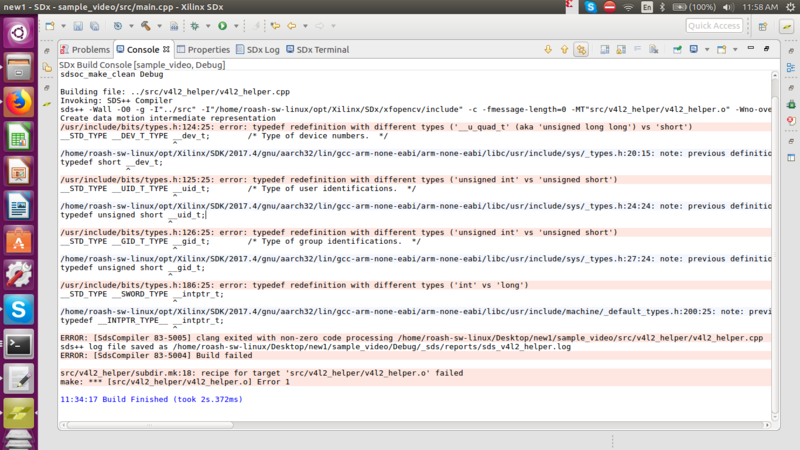 it means it worked and build successfull for vec add (sdx examples) alredy there in samples.